Sunsets over the Kremlin or wooden churches of the Golden Ring can remind you of the magnificent beauty of the world. These moments are still and immeasurable. Yet, travelers come from all over the world to watch the Siberian sunset over the world's largest mirror. In silence they come to contemplate eternity over at Lake Baikal's ancient shores. Listvyanka is the main tourist center of Lake Baikal. It is usually the first settlement that travelers come to, thus there are many things to do. Rent bikes, horses or go rafting in the summer. During warm evenings take a mineral bath in Chivirkuy Bay and relax on pebble beaches and take in the setting sun. In the winter a steam-sauna is a must, where guests can heat up and then jump in the snow. It is also possible to rent a snowmobile, go skiing or try dog sledding and there are countless museums to visit, including the Limnological Museum of Baikal flora and fauna. Watch the sunset here at the magnificent port of the Angara River or, for the adventurous, scale the two-kilometer trail up to Chersky cliff for immaculate views out over Lake Baikal from the observation platform. It is possible to get here by public bus, but if the opportunity presents itself rent an SUV, scale the dirt track for three hours and follow a time-honored tradition by tossing a coin out the window at the turn for good luck and enjoy the path's turbulence all the way to Gremyachinsk. Here visitors will find a calm and peaceful place with cows, pigs, horses and goats grazing freely near the beach. Here the shores are on the sunset side of the lake, which can make for unforgettable evenings. In the winter, walk out on the frozen water and view the sunset from 100 meters off the shore. Or turn around and go inland to the tropical lake just outside the village for 20 degree waters and solitude. The Circum-Baikalrailway begins at Slyudyanka at the southern tip of Lake Baikal. The Circum-Baikal railway was one of the original sections of the famous Trans-Siberian railway. Later on a duplicate of this section was built, allowing the Circum-Baikal to stand separately as its own line. Its unique construction and route along the shore make an excellent excursion through tunnels and over bridges at the Lake’s edge. Many trains depart daily. Some travelers take the railway the entire distance from Slyudyanka to Listvyanka, enjoying the views from the window and the opportunities to relax and meet other travelers. Others travel small distances and take advantage of the outdoor activities along the way such as camping and trekking. 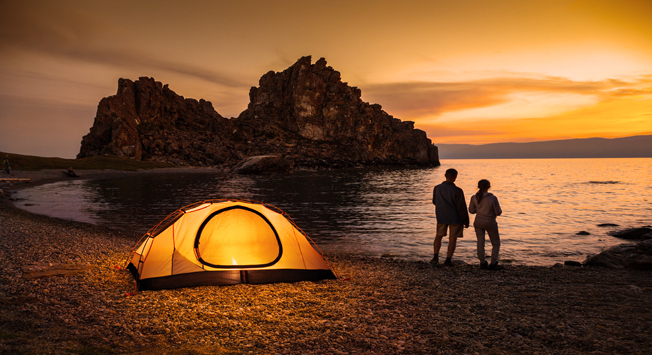 Watch the sunset out of the cabin window rolling along Lake Baikal or from a tent at its shores. Lake Baikal is so large that it has often been mistaken for a sea. Some days it is calm while on others it roars like an ocean. The local culture is as deep and rich as the lake itself. Catch a sunset on the mystical shores near the Shaman Rock or the sandy remote beaches of Buryatia. Fall asleep under the golden sun pouring in through the window on the Circum-Baikal line. If you are looking for a special romantic experience unlike anything else, consider Lake Baikal. It is much easier to get to than most people think and it is one of our most popular recommendations. To get to Lake Baikal, take the train or fly to Irkutsk. From there catch a ferry down the Angara river to Listvyanka Village, or take the bus in winter. This story was contributed by Slava Shirokov, a COO at Travel All Russia - a destination management company organizing some of the best tours to Russia for travelers from all over the world.